The West Indian-American Carnival Labor Day Parade comes to Brooklyn's Eastern Parkway. 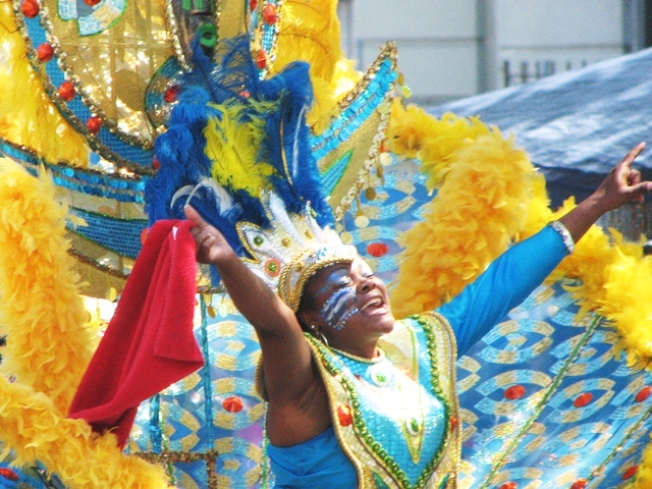 PATTY TIME: Come for the elaborate floats, costumes and makeup, stay for the live music, dancing, and scrumptious Caribbean street food: the West Indian-American Carnival Labor Day Parade takes over Eastern Parkway from 11AM to 6PM. ’CUE BALL: Once again, Williamsburg’s ArtLand Bar will bid farewell to summer with a bash full of free eats and soulful live DJ action under the sky. Beats & BBQ: The Labor Day Sendoff '09 goes from 4-10PM. DON’T MESS: Celebrate Labor Day the West Texas way: An all-you-can-eat barbecue smorgasbord awaits on the roofdeck at the East Village’s Marfa, where you can wash down smoked chicken, ribs, wild boar and seafood with the restaurant’s home-infused vodka. Only downside? Tuesday’s not a holiday. $15-17, from 5PM on.